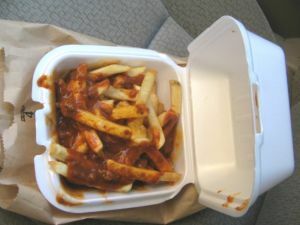 I never ate chili fries at home growing up. I was a very deprived child; my mother being both a vegetarian and a health food nut. My love affair with them began later, when my best friend and I used to eat chili fries at the Los Angeles Zoo whenever we went there on a ditch day an educational field trip. Later, after we moved to the Bay Area, we spent many an afternoon bemoaning the lack of good, local chili fries, especially with animal shaped french fries. Now, being the good mother that I am, I often make chili fries for my own kids. I cheat a little bit too, even though I abhor the sort of advice that tells you to sneak pureed carrots into spaghetti sauce so that your kids will eat their veggies. I add frozen chopped spinach, or yes, pureed carrots to the frozen chili, but it’s mostly because doing so is easier than making a salad and I’m a fairly lazy cook. When I make chili fries, I like to use frozen chili, in large part because there is no good canned chili available here in France. I also use jojo potatoes instead of regular french fries. If I were really inspired, and wanted to kick it up a notch, I would make turkey and black bean chili, with lime juice for extra tang and serve it with home-made sweet potato oven fries. But I’m not, so I don’t. Do you have a favorite meal from your childhood that you now serve to your own children? Not really. Since Hubby would cringe at some of the things we used to eat when I was a kid( ramen noodles and cut up hot dogs comes to mind), I tend to not make them. Also, my boy loves fruit and veggies, so any meal from my childhood he would probably turn up his nose at lol. Minced Beef & Onion Pie and Vegetable Stew, two of my favourite meals when I was a kid and two meals that all of my children love too. When it comes to sneaking in veggies, I’ve had to do it because my son would just never eat them otherwise. They either have to be in a stew or casserole, grated into pasta sauces and the likes or mashed up with potatoes. I figure that as long as he’s getting them, it doesn’t matter how. Next post: How Do You Take Your Hundreds?